Reality Check: Are there 6,700 fewer mental health staff? The claim: At least 6,700 mental health nurses and doctors have been cut from the NHS in England since 2010. Reality Check verdict: That's about right. The Conservative Party is promising there will be 10,000 more staff working in mental health treatment in England by 2020. 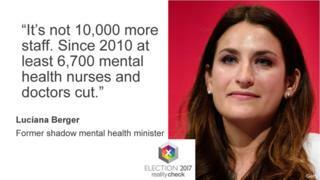 But Labour's former shadow minister for mental health Luciana Berger tweeted to say that the number of doctors and nurses working on mental health had actually been cut by 6,700. In an answer to a parliamentary question from Ms Berger, Health Minister Philip Dunne provided figures showing that the number of nurses working in mental health in England had fallen from 45,384 in 2010 to 38,774 in July 2016 - a fall of 6,610. On the figures for doctors, if you look at the monthly NHS England workforce statistics in the psychiatry group, there were a total of 8,676 people listed from consultants to clinical assistants in January 2017, compared with 8,699 in May 2010, so that's a fall of 23. But that may not cover all of the doctors working on mental health.